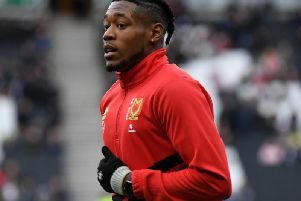 MK Dons boss Robbie Nielson is delighted that Kieran Agard has ’turned the corner’, and is backing the striker to now go on and top the club’s goalscoring charts this season. Agard has endured a difficult start to the season, and prior to the weekend trip to Charlton had failed to hit the target. But he scored twice last Saturday, including a stoppage time penalty to seal the 2-2 draw at the Valley, and was on the mark from the spot again in Tuesday night’s 1-1 draw with Southend. “Thankfully Kieran has turned that corner,” said Neilson. “I spoke to him a couple of weeks ago, and I want him to continue to do what he does. “He works extremely hard, he gets into good areas, and takes up good positions, but it just wasn’t clicking for him. “Thankfully in the past couple of games it has, and hopefully that can continue because Keiran is one of our key players. Agard’s three goals this week have taken him up to joint third in the Dons’ scoring charts, alongside fellow front man Chuks Aneke, defender Ethan Ebanks-Landell and midfielder Aidan Nesbitt. Ed Upson is second with four goals, while leading the way with seven goals is Gboly Ariyibi. Agard will be hoping he can add to his tally this Saturday when MK head north to take on Doncaster Rovers.